The 2013-2014 Apgar Award has gone to an innovative new class integrating writing and the complex world of philanthropy. SOC/WRIT 307 Learning by Giving: Nonprofit Organizations and American Cities in the 21st Century offers students an opportunity to engage in partnerships with nonprofit organizations. The course is now being offered for the second time, and the theme for this year is homelessness and affordable housing. 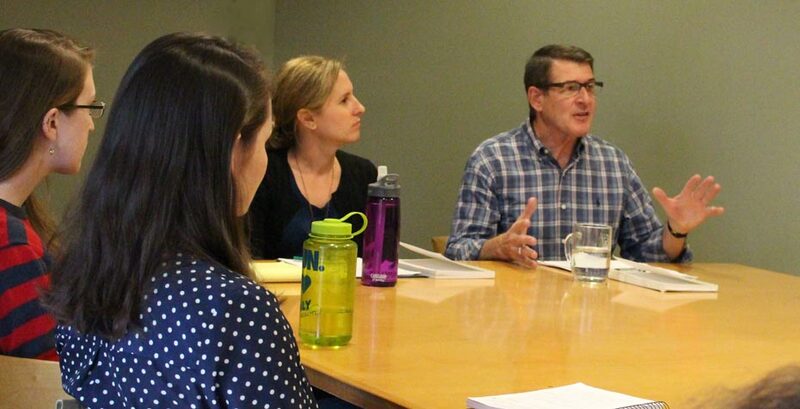 Team-taught by Lecturer in Writing Anne Brubaker and Professor of Sociology Lee Cuba, the course aims to both enhance students’ communication and research skills beyond the classroom experience, and to strengthen the students’ understanding of American cities and the nonprofit organizations that serve them. The course received a $10,000 grant from the Learning by Giving Foundation, which seeks to promote student learning about effective and responsible philanthropy and to help prepare a new generation of philanthropic and nonprofit leaders. At the end of the course, the students are given the responsibility of distributing the $10,000 to one or two of the nonprofits for which they proposed grants. The nonprofits under consideration in Fall 2014 are Boston Community Capital, Hearth, and HomeStart. “It really is a course of consequence,” says Cuba. Students are writing with purpose: “You don’t want to write just any grant; you want to write a fundable grant.” At the beginning of the semester, the students are divided into teams that will work together for the entire course. Students start by writing a memorandum of understanding with their group to outline their expectations for one another. Then, teams work closely with their designated nonprofit organizations for the rest of the semester as advocates, conducting research to write a grant proposal that will earn the nonprofit the $10,000. Michele Ross DS'15 took the course last fall, and loved it. She says, "The class of 12 students is a perfect size for such an intense writing experience. Professors Cuba and Brubaker are wonderful to work with and learn from. They guide the discussions of the readings, help facilitate initial meetings with organizations, and help teams structure their work around the different stages of the grant writing process." But then, she says, the professors step back and it is truly up to the writing teams to interact with the organizations, create contracts and agreements, research possible projects, and pitch grant proposal ideas. Ross agrees, that is a challenge. "It is not easy to take off the writing hat and put on the objective grantor hat... students in this class understandably become attached to their projects and organizations! The actual reading and decision making process is entirely student led. Professors Cuba and Brubaker coach this switch expertly, but once again, step back and let the class learn to do this hands on." Brubaker says, “Every step of the way, everything is an exercise in writing. There are other colleges teaching these kinds of courses but they don’t often have the students write a grant, so this is really a distinctive feature of the course.” The nonprofits involved with the course generously offer their time and expertise to provide a valuable learning experience for the students. Experts and professionals from the philanthropic world are also invited to address the class. Fall 2013, for example, featured four guest lecturers: Joan Wallace-Benjamin '75, president and CEO of The Home for Little Wanderers; Ira Silver, professor of sociology at Framingham State University; Ellen Luger '83, executive director of the General Mills Foundation; and Barbara Harman, executive director of the Harman Family Foundation. The experts spoke of their experiences working in philanthropy and shed light on the growing nonprofit sector. For their development of this course, Brubaker and Cuba received the 2013-2014 Apgar Award, a prize endowed by Anne Nelson Apgar '70 to recognize a faculty member who motivates students' interest, curiosity, and love of learning; proposes and applies new teaching concepts and methods; and serves as a mentor to stimulate students' intellectual development. See SOC 307/WRIT 307 Learning by Giving and other unique Wellesley courses on our Spotlight on Teaching page, a regular feature in which we take a moment to look at one of Wellesley’s extraordinary courses and instructors.